I thought I’d try out a quiche this afternoon. Not words I thought I’d be saying as a younger man, but then I suppose things change as one, err, ‘matures’. Besides, quiche is a kind of Gallic pizza. Working from a base of shortcrust, and unsweetened custard you can go on to produce all manner of combinations to taste. I thought I’d try smoked salmon and leek, mainly as that was what I found rummaging through the fridge. Sorry, salmon is featuring a lot on this blog I know, but I did have a fair bit left over from the party last week. That’s mainly because, I’d forgotten all about it and left it in the fridge. For the record, I do recognise that other fish species exist and are edible…. 100g smoked salmon, chopped into small pieces. Start by softening the leek: add the oil and butter to a small frying pan and gently fry with a pinch of salt until softened. Turn off the heat and leave to cool whilst you get on with the next stages. Very lightly butter or oil a smallish circular baking tin (if using a solid one). You won’t need to if using a loose base version, but I don’t have any. Roll the pastry into a large circle so that it fits into the tin with plenty overhanging (4 or 5cm). This extra will help ward off shrinkage in the oven. Gently press the pastry into the sides of the tin and use a fork create small holes to ensure the base doesn’t puff up. To be sure, I lined the top of the pastry with baking parchment and baking beads (courtesy of my friend Sarah). I used a tip flying around at the moment which is to screw up the paper first so it’s flexible and doesn’t need to be cut to fit. Blind bake the pastry at 190ºC (Gas 5) for 25 minutes or until golden. I removed the parchment for the last 10 minutes to help it crisp up better. Once the pastry case is ready take out the oven and allow to cool for a little while on a stand. Leave the oven on though as it won’t be too long until it goes back in. When cooled enough to do so, neatly trim off the excess pastry from the edge with a sharp (but not your best) knife. Pour in the mixture and return to the oven for around 30 minutes, or until the top has started to brown and the middle is ‘springy’. Leave to cool, again, and serve it up still warm if you can. Just as nice cold though of course….. 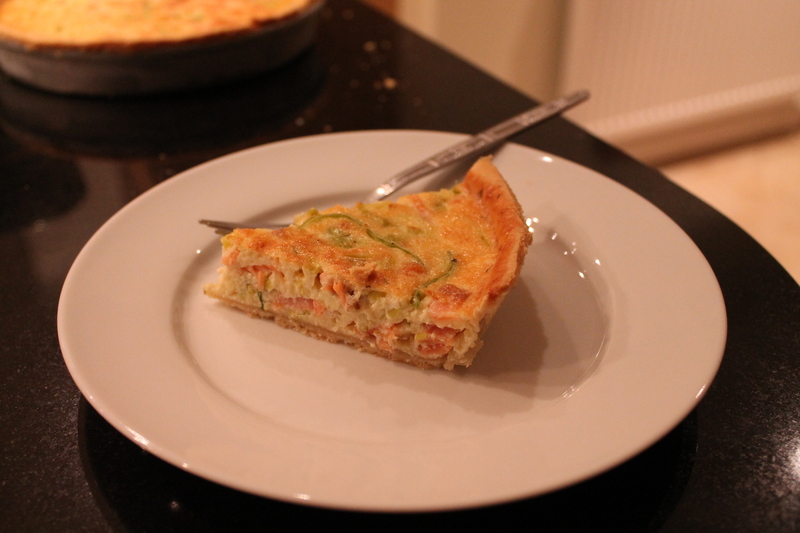 This entry was posted in Recipes and tagged leek, quiche, salmon, Smoked by Phil @foodfrankly. Bookmark the permalink.